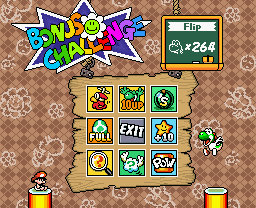 Flip Cards is a Bonus Challenge in Super Mario World 2: Yoshi's Island, Yoshi's Island: Super Mario Advance 3 and Yoshi's Island DS. For both games, it is the minigame of World 1. In this minigame, there are nine cards, known as Flip Cards, facing down. When the player chooses which one they want to flip, Yoshi will toss a Yoshi Egg at the card and flip it over. The cards each have a picture that denotes their effect. If Yoshi gets a Toady, then nothing will happen. If the Yoshi gets an item, such as a star or watermelon, he will receive that item. Yoshi can also gain extra lives. However, if the Kamek card is flipped, Yoshi loses all accumulated rewards, and the game ends. At any point, the player may choose the Exit panel to stop the game and keep all of the rewards that have been acquired. If Yoshi can flip seven cards without flipping the Kamek card, then he'll receive everything that he has earned, and Kamek will fly away. He'll flip the remaining card, which gives Yoshi a 10-Up card to collect. Sometimes, this card is impossible to acquire due to two or three Kamek cards being on the board, in which case the player would have to choose the Exit panel to retain the items. In Yoshi's Island DS, the item panels were replaced by Flowers and heads of the Babies. Because the game does not include items, these cards provide the same bonus of one life. As in Super Mario World 2: Yoshi's Island, flipping over a Toady gives the player nothing, but flipping over Kamek causes the minigame to end, as well as canceling any bonuses received. Yoshi can earn a 14-Up if he flips all non-Kamek tiles. This page was last edited on March 2, 2018, at 19:51.